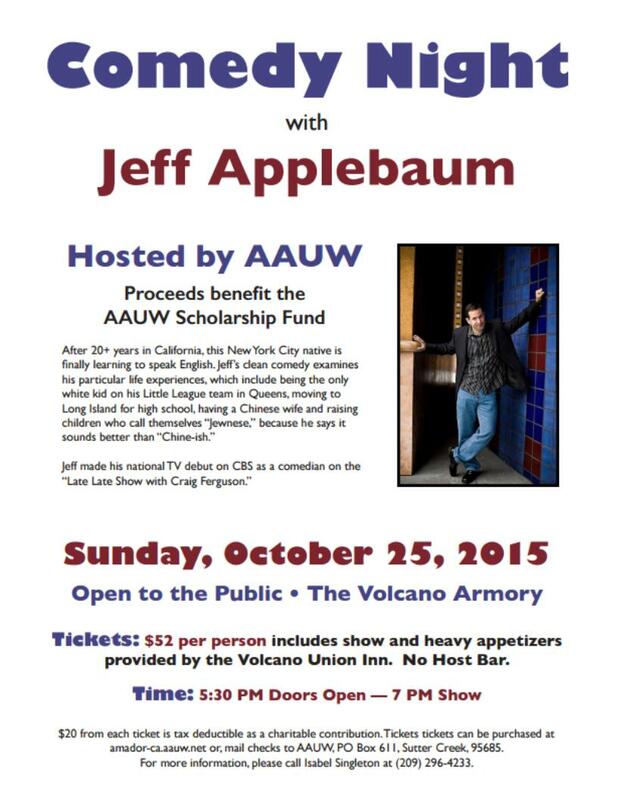 American Association of University Women (AAUW-Amador Branch) is sponsoring a comedy event. Jeff Applebaum made his national TV debut on CBS as a comedian on the “Late Late Show” with Craig Ferguson. Now he is ready to examine his particular life experiences in his unique comedic manner. 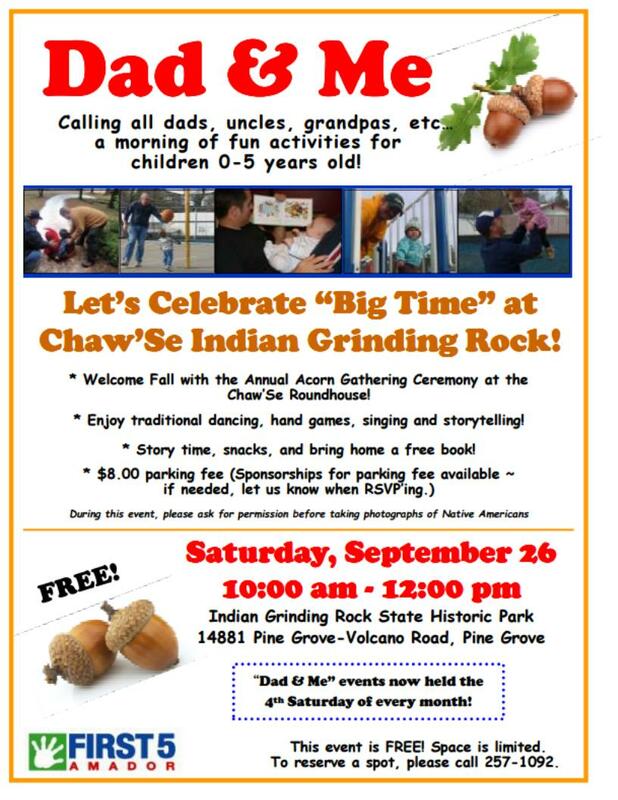 Come on out Sunday, October 25th, 2015 at the Volcano Armory, (next to the Volcano Union Inn, 21375 Consolation St. in Volcano). The event will start at 5:30 PM that evening, when doors open with time to enjoy the generous appetizers supplied by the Inn and included in the ticket price. There will also be a no host bar; show begins at 7:00 PM. Tickets are $52 per person, and $20 from each ticket is tax deductible as a charitable contribution to the scholarship fund. Tickets can be purchased at Amador-ca.aauw.net through PayPal or mail checks to AAUW, PO Box 611, Sutter Creek, 95685. 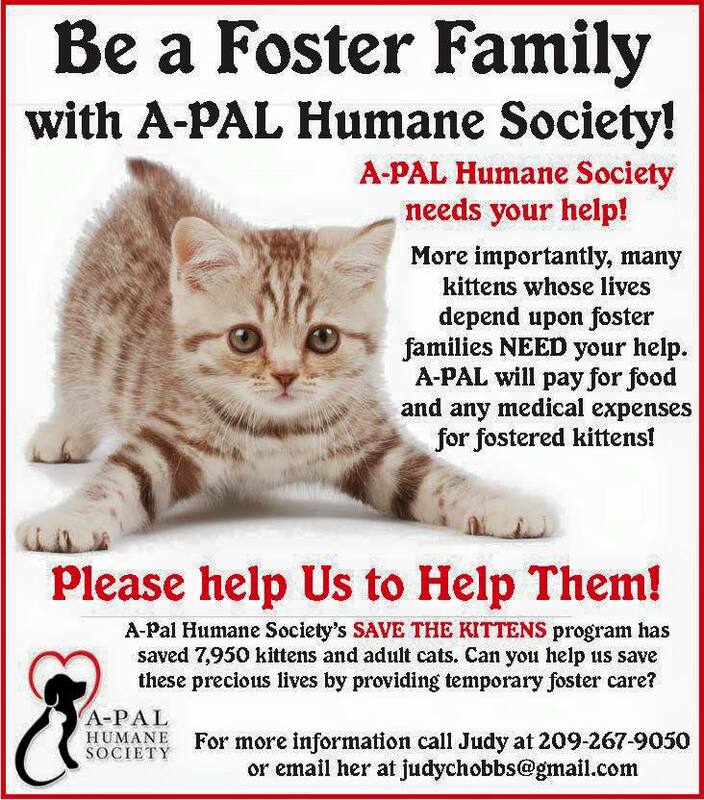 For more information, call Isabel Singleton at (209) 296-4233. 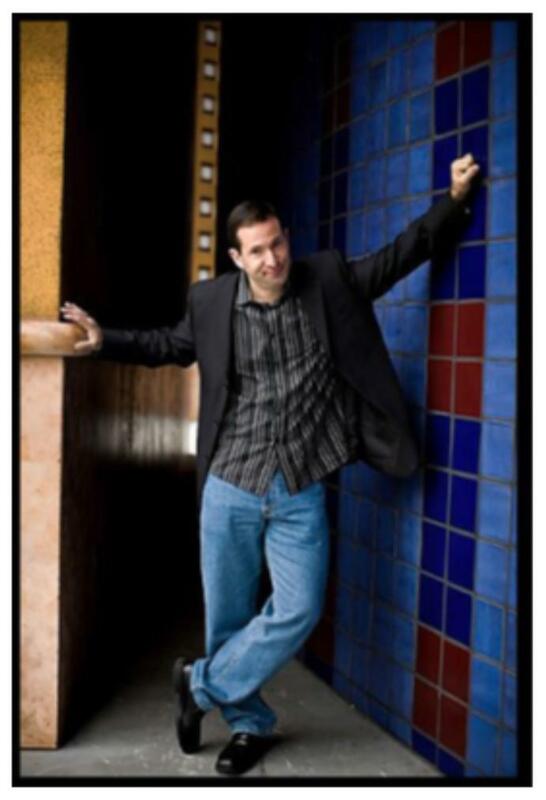 Please do plan to attend this entertaining event with a nationally known comedian, and at the same time support the AAUW scholarship funds for local girls and women in our community. In recognition of the high fire danger in the Upcountry, on Tuesday Sierra Pacific Industries Community Relations Manager Mark Luster presented a check for $5000 from SPI Foundation to Lockwood Fire Protection District Captain Kris Mittelstadt. Two 5000-gallon water tanks will be purchased and installed on company land in the Fiddletown Road corridor. Lockwood FPD is primarily a volunteer department with one contract firefighter. "The LFPD district has only 2 fire hydrants in the Shake Ridge corridor, so the addition of 10,000 gallons of firefighting water is a great benefit to our community. LFPD is very pleased to partner with SPI on this critical need, " said Captain Mittelstadt. Sierra Pacific Industries is based in Anderson, California. The company owns and manages 1.9 million acres of timberland in California and Washington, and is among the largest lumber producers in the United States. The Butte Fire caused the cancellation of the Amador STARS Camp Out for Cancer. 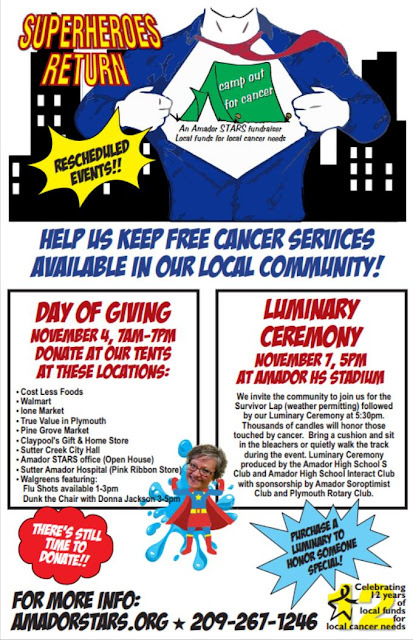 Our event goal is to raise $100,000 to help the Amador STARS provide services to our community cancer patients. Amador STARS has 6 vans and over 40 volunteers who transport patients to cancer related appointments throughout San Joaquin, El Dorado, Calaveras, Sacramento, Amador Counties and on a as needed basis to the San Francisco Bay area. We also offer classes for women in treatment, scarves, caps, wigs, and support group. We offer a lending library and resource services. 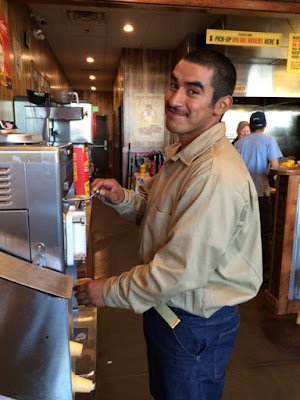 Amador STARS is located at 60 D Ridge Road in Sutter Creek. The Amador County Camp Out for Cancer co chairs have regrouped and are excited about our new fundraising plans to help us recover our loss of the event. 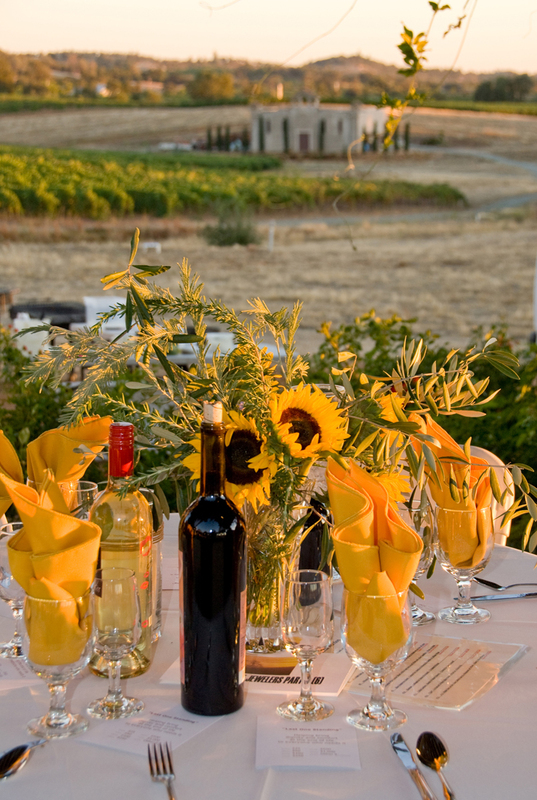 The Foothill Conservancy’s 25th anniversary celebration, scheduled for Saturday, October 10, will be held as planned. All are welcome. 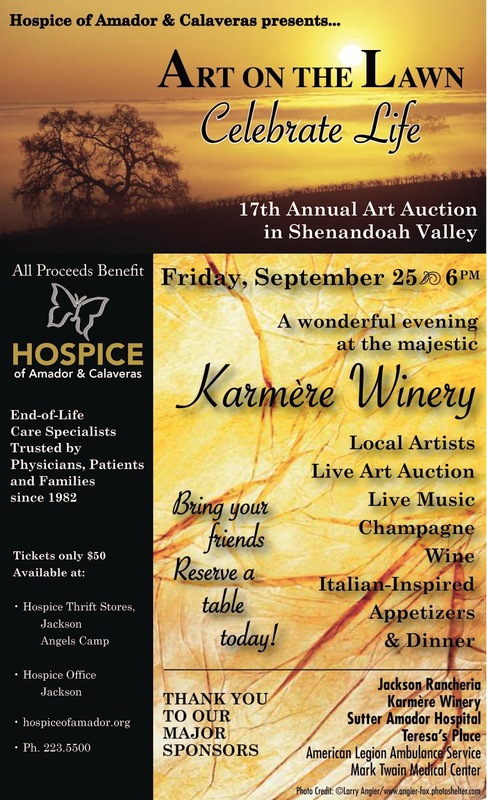 The event will be at Karmère Vineyards, with festivities starting at 5:30 p.m. Event tickets are $50. Delectable appetizers will be provided by Lucy’s Spice Box. 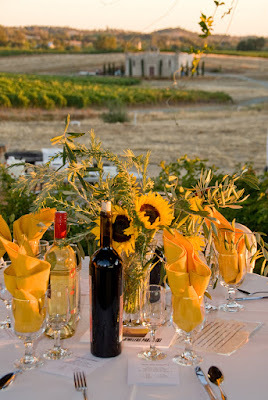 Guests can also enjoy complimentary local wines and craft beers. Local musicians Herb Boxhorn and Klaudia Promessi will be playing an eclectic mix of jazz and contemporary favorites. Raffle prizes include lodging at a Tahoe-area private vacation home, Kit Carson Lodge, the Hotel Leger and the soon-to-open Rest in Plymouth. Martha Davis, former executive director of the Mono Lake Committee, will provide timely and inspiring words on the importance of (often small) dedicated community-based organizations to local communities, residents and their environment. The Foothill Conservancy was formed by local residents concerned about the environment and quality of life in Amador and Calaveras counties. It held its first public meeting in October 1989 and incorporated in 1990. The Conservancy’s mission is to protect, restore and sustain the natural and human environment of Amador and Calaveras counties for the benefit of current and future generations. It advocates for watershed and forest restoration, good land-use and water supply planning, Mokelumne River conservation, sustainable economic development, and protection of agricultural lands. Tickets can be purchased online at Brown Paper Tickets, http://fc25thgala.brownpapertickets.com. For more information or to purchase raffle tickets contact Carolyn at carolyn@foothillconservancy.org, or 209-223-3508. Camp Out for Cancer UPDATES! We are very sorry that we had to cancel the Camp Out for Cancer this year. In the fifteen years of this event, we have never had to cancel the event before. We have overcome some major hurdles put in front of us and have always been able to come through with an awesome event. This year the Butte Fire threw hurdles at us that we just couldn't overcome. We tried to reschedule, but there were no venues available in October. We appreciate how much work everyone has put into the event and so we created a new plan of action! Check our website www.amadorstars.org for up to date information. There will be 3 events! #1 We are holding an online auction very soon, and ask all of you team members to deliver to the STARS office anything you have saved from our Camp Out for Cancer event, that can be placed in our online auction. Your raffle baskets, gift certificates, quilts etc. We will photograph the items and place them in the online auction. We need the items this week, so we will have time to photograph and get them all put online. If you cannot get the items to the office until next week, we will try to the best of our ability, to add them to the online auction. It is okay to share the event with your friends, after you receive the link soon, but we are going to ask the winners of the raffle to pick up the items at the STARS office. So if someone wins an item and lives outside our area, you must be the point person to pick up the item for your friends. There will be designated pick up days. Everyone purchasing the items will use the online pay system that is included with the auction procedures. #2 We are holding a Day of Giving Super Heroes Return the Camp Out for Cancer. November 4, we are setting up stations throughout Amador County. We will have EZ UP Tents, super hero decorations and volunteers (hopefully dressed as Super Heroes, or at least dressed in a Camp Out for Cancer tee shirt) taking turns manning the stations from 7 a.m. until 7 p..m.
also hoping for approval for Sutter Creek, we are submitting the forms for permission. Our goal is to ask the public to come by and make a donation. We have other surprises for each location and we will also be selling luminary bags at these locations. At this time, we do plan this event to be rain or shine. #3 Survivor Celebration combined with a Luminary Ceremony at Amador High School on Saturday Nov. 7th, this event will be totally student driven with the Amador High School S Club and the Interact Club sponsored by the Soroptomists and Rotary Clubs. Times to be announced soon. Amador High School was the home of the very first event in September 2001. Everyone who had registered to attend this years Survivor Celebration will receive a new invite in the mail in a few weeks. Also, not as a part of this list but another event that team #30 has planned. However it does raise funds for Camp Out for Cancer! This team is doing their fundraising event in November for next years fundraising event. November 14th Dinner - Dance at the American Legion Hall featuring the music of Over the Edge. Tickets are $30 each and are available to the Amador STARS office, or by mailing a check payable to Amador STARS to P.O. Box 208, Jackson, CA 95642 Limited number of tickets available. We encourage you to purchase your tickets early. of special note: Over the Edge performed the National Anthem at the San Francisco Giants game in July. Together, we continue to make a difference in the lives of so many cancer patients! Any questions, you can contact any of us for more information! Amador County, Calif.—Pacific Gas and Electric Company (PG&E) and the Amador Fire Safe Council (AFSC) have completed installation of two new fire detection cameras in Mount Aukum and Red Corral designed to help CAL FIRE detect and confirm fires in remote areas. “These fire cameras are designed to help assist CAL FIRE in rural areas in fire detection, confirmation and response. 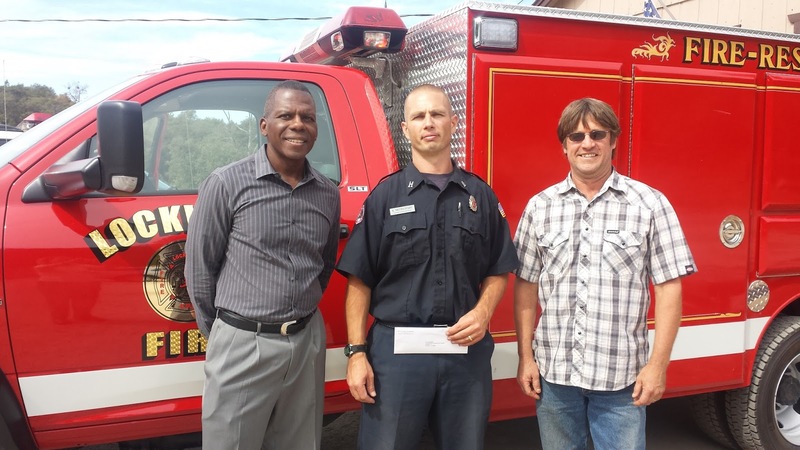 The ongoing partnership with the Amador Fire Safe Council to get these cameras installed is a great success and an excellent example of nonprofit and private organizations working together for the greater good,” said Nick Glero, manager for PG&E’s Stockton Division. The two cameras were installed in Mount Aukum and Red Corral. The cameras confirmed two fires in the first ten days after they began operating. A PG&E-funded fire camera in Butte County recently detected a fire intentionally started by a woman who was stranded after delivering her baby in the woods. The images were sent to a dispatch center which alerted Butte County fire officials; the woman and her newborn daughter were rescued and taken to a local hospital. “Through the camera installations, we are able to help keep our community fire safe and support CAL FIRE in early fire response,” said Cathy Koos Breazeal, executive director of AFSC. The partnership also included local telecommunications companies. Volcano Communications Group (VCG) donated the tower mounting space at Red Corral for the camera which overlooks the Mokelumne River watershed. VCG also donated ongoing use of power, backup power and electronics rack space in its facility at the Red Corral tower site. 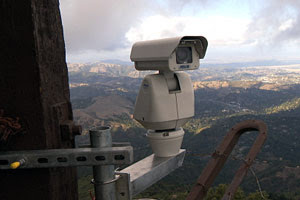 Cal.net, along with cooperation from American Tower Corporation, provided tower space for two cameras on Mt. Aukum. Cal.net also donated the internet bandwidth required to operate the cameras. PG&E has provided funding for 36 camera installations in 2014 and 2015 in eight counties. Each of the ForestWatch cameras scan 400 square miles of territory every four minutes, day and night, and are able to alert technicians to possible fire activity. When a fire is confirmed, the system can determine the exact location for an efficient response. ForestWatch is accessible from any mobile device, offering fire fighters valuable visual data on fire behavior, ground cover and any threatened homes or infrastructure. The technology also can provide a time stamped archive of photos of each fire assisting investigators in post-event analysis. Funding daily fire patrols from 2:00 in the afternoon until dusk – the time of day when wildfires are most likely to ignite because hot, dry weather is at its peak. Through partnerships with PG&E, CAL FIRE, local fire departments, US Forest Service and Bureau of Land Management, Amador Fire Safe Council develops community wildfire protection plans, creates landscape-scale hazardous fuel reduction projects, and offers chipping, defensible space and public education to the public since 2002. ForestWatch, a subsidiary of EnviroVision Solutions of Roseburg, Oregon, is an award winning wildfire detection system that has been utilized by governments and forestry industries around the world since the 1990s. ForestWatch combines programmable cameras and advanced image processing software into a powerful decision support and emergency management system. Hospice of Amador & Calaveras is gearing up and making plans for their beloved 17th annual Art Auction, “Celebrate Life”, to be held again at the majestic Karmѐre Winery in Plymouth on September 25th at 6:00 pm. Once again a sellout is expected with a crowd of approximately 200 people. This year’s theme is “Celebrate Life” reminding us of Hospice’s intention to help patients live every moment to the fullest. It’ll once again be an elegant, special evening under the stars, sipping champagne & award winning wine, listening to a live jazz performance by Jack Riordan and his sister Ellen Edwards, strolling through the gardens perusing all of the lovely one-of-a-kind local artwork, bidding on great raffle and silent auction items, savoring Italian-inspired cuisine by Teresa’s Place, and the highlight of the night – the exciting live auction! 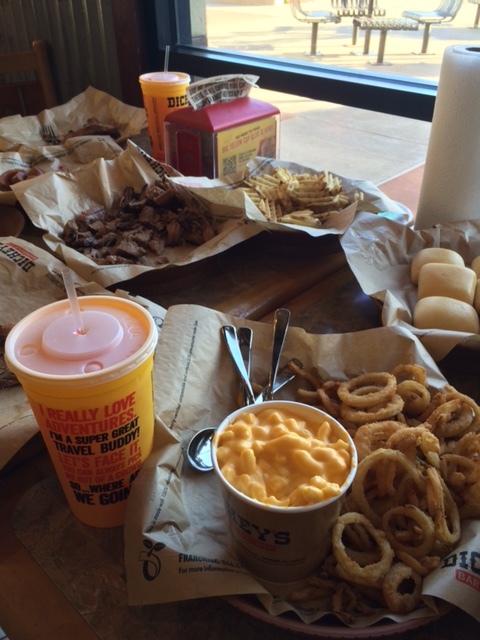 All of this for only $50 per person! Bring your friends & reserve a table to not miss out on this special night. Follow Hospice on Facebook at www.facebook.com/HospiceofAmadorandCalaveras or check out their website www.hospiceofamador.org for updates, sneak peeks of the fabulous art creations, and much, much more as the event gets closer! Special thanks to Hospice’s loyal community partners, Todd Pickens, Marilyn & Hayley Hoopes for once again generously donating the use of their gorgeous winery, Karmere Winery & Vineyards; and other loyal major sponsors for this year’s event; Jackson Rancheria, Sutter Amador Hospital, Teresa’s Place, American Legion Ambulance Service, Mark Twain Medical Center and Thomi’s Café. Hospice has been providing quality end-of-life care to patients and families in Amador and Calaveras for 30 years. The money raised each year allows our local non-profit, independent agency to continue with the important work of providing hospice in our community, to everyone who needs it, regardless of their ability to pay. Tickets are $50 and they are selling fast! Get your tickets today or to reserve a table by calling 209-223-5500; or go online at www.hospiceofamador.org; or visit any of the following locations: Hospice Administrative Office (Jackson); Hospice Thrift Stores (Jackson) and (Angels Camp). For more information regarding this fundraiser benefiting Hospice of Amador and Calaveras Counties, please visit www.hospiceofamador.org, or phone 209-223-5500 and ask for Renee Davis. Special thanks also to Larry Angier for graciously allowing us to again use his gorgeous sunset photo taken from Cooper Hill for the event logo. Foothill Conservancy invites everyone to join us for the 2015 Mokelumne River cleanup on Saturday, September 19, from 8:30 am until noon. Whether you have volunteered for the Mokelumne River cleanup before, or are coming for the first time, your efforts will help improve the water quality of this local treasure. Participants will get first-hand experience in identifying harmful impacts to the river, and learn about the importance of the Mokelumne's watershed for recreation and fish and wildlife habitats – all while having fun! 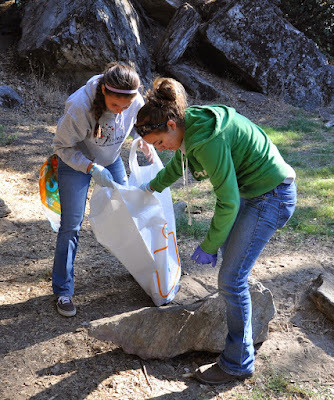 “The Mokelumne River cleanup volunteers remove trash and recyclables from the river. Every year they share the satisfaction of making our river pleasurable and safe for all, from the wildlife that live there to the people who come visit.” said Carolyn Schooley, cleanup coordinator. Volunteers should wear sturdy boots and long pants, and bring work gloves, a hat, sunscreen, insect repellant and a water bottle. Coffee, water and snacks will be provided. Photos below are from previous years' clean-ups. With all four crews out fighting fires, we didn’t have many guys left in camp for our scheduled Friday night “A-Phase Event”. YCC Nguyen took the few guys we had in camp to Dickey’s BBQ in Jackson for dinner. It was a great opportunity to teach them some restaurant etiquette and how to navigate Dickey’s specialty menu. 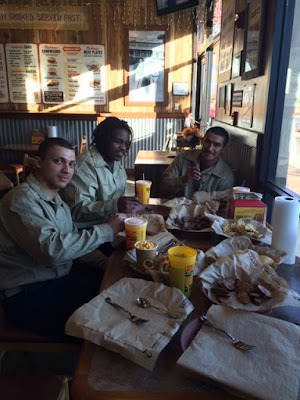 The hospitality and the BBQ were excellent, and they all enjoyed the free soft serve ice cream!